I seem to be drawn to cooked veggie salads lately and why not? I believe these hearty salads are perfect during our wonderful warm days and cool evenings. 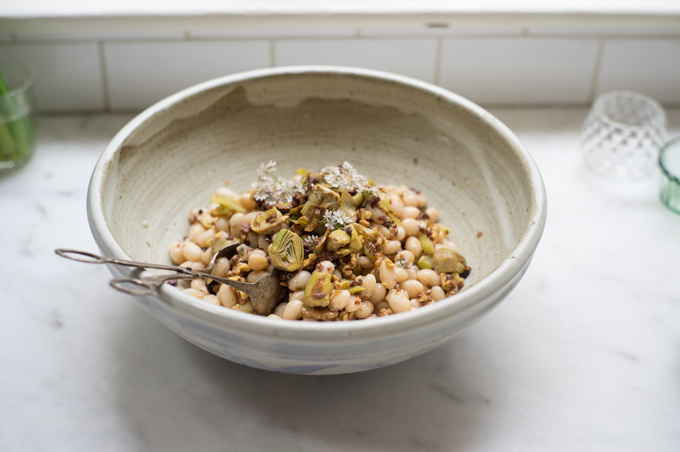 The native Californian in me absolutely could not resist Heidi Swanson’s gorgeous Cocagne Bean and Artichoke Salad. Growing up we didn’t do a lot of gourmet eating, to say the least, but when artichoke season arrived my mom always splurged. And, like many California gardeners, we also grew them ourselves. I still smile when preparing them as I recall my father’s line he would repeat each year when the first ones appeared on our dinner table, “Someone had to be mighty hungry to figure out this plant was edible.” Not being a veggie man he certainly appreciated artichokes. While prepping artichokes is certainly more labor than say, asparagus, those of us passionate about them will make the effort. I suggest using Bon Appetite’s great guide to make quick work out of your purchase of baby artichokes. You will find the complete instructions here. What I love about this dish are the many variations. You may want to consider subbing out chickpeas for the white beans, replacing the olives with golden raisins and the walnuts with pine nuts for an entirely new dish. You will note I didn’t change out those coveted artichokes, but you certainly could do so yourself. Don’t forget to start this meal off with some slices of cantaloupe or watermelon that have begun making their appearance. Having that bit of raw food at the start of this meal will have an alkalizing affect on your lymphatic system and aid digestion.